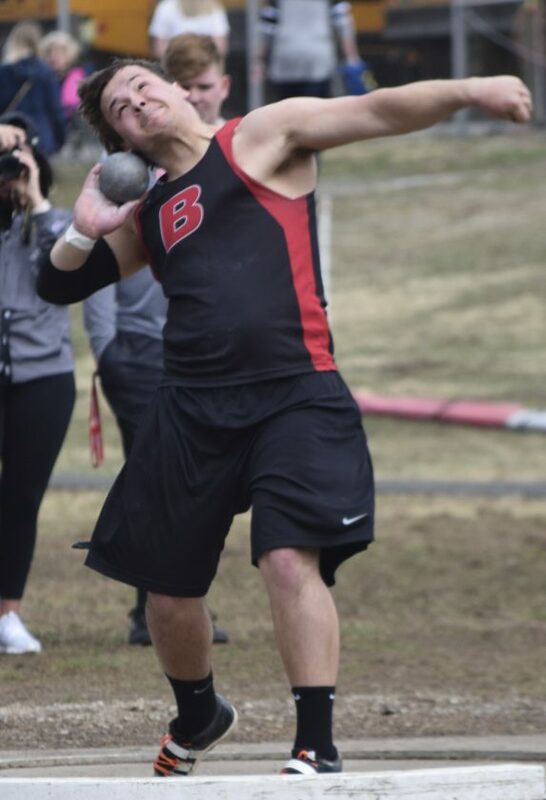 T-L Photo/SETH STASKEY BELLAIRE SENIOR Cole LaRoche unleashes the shot put to a new career-best mark of 61-2, which set a school record and won him the title at Saturday’s Bellaire Relays. BELLAIRE — The calendar still read March, but the 65th annual Bellaire Relays had the feel of the meet had been known for many years ago when it was contested during the last Saturday in April. With high-level competition, fast times and a large turnout at overcast Nelson Field, the Bellaire Relays returned much of its intrigue. However, the intrigue didn’t carry over to the team races. Dayton Dunbar’s boys and Wheeling Park’s girls ran away and hid from their respective fields for the team titles. Wheeling Park finished second in the team race to Dayton Dunbar. The Patriots got going early in the meet with a victory during the opening session in the shuttles. The quartet of Nate Adams, Devaughn McWhorter, David Fox and Andrew Glass skimmed40 hurdles in 62.03 for the title. Shadyside, which finished third in the team scoring, produced a quartet of winners. Fueling the Tigers was senior distance Chase Stewart. He won the 1600 and 3200 meter runsin times of 4:27.40 and 10:15.87. Sophomore Jordan Joseph claimed victory in the high jump with a 5-8 clearance. Senior Dale Hawthorne opened his season impressive with a victory in the pole vault and an 11-6 clearance. The host Big Reds’ lone win came in the shot put circle. Defending state champion Cole LaRoche was impressive in winning his specialty with a career-best mark of 61-2. He won by nearly eight full feet. Bridgeport senior Kevin Herink won the discus to give the Bulldogs their only victory with a mark of 138-10. Harrison Central picked up a victory in the 800 thanks to the work of senior standout Sam McClelland. He ran two laps in 2:00.47 for the win. Wheeling Park ran away with the title. The Patriots scored 131.33 points, which was 75.33 better than runner-up Cleveland Heights. The Patriots picked up six victories. Fueling the Patriots was junior hurdling ace Aubrey Wiethe. She won the high and low hurdle titles in 16.77 and 49.22, respectively. Junior Abby Snedeker was also a double winner. She was the champion in the 200 meter dash with a brisk 26.62 clocking. That came after she won followed Wieth’s high hurdle win in the 100 with a 12.97. Junior Cheyenne Nash ignited the Patriots in the opening event of the morning when she won the shot put with a heave of 37-11. Park added to its total when the foursome of Aaliyah Speights, Wiethe, Amari Poole and Snedeker passed the baton to a 51.61. River’s Livi Beard was the champion in the 3200 meter run with a time of 12:31.54. Indian Creek’s 4×4 team — which claimed the 2017 state championship — secured a victory in the final event. The team of Allyson Tweedy, Rileigh Gualtiere, Abby Copeland and Sloane Lewis posted a 4:19.56. The same foursome won the 4×8 as well. It clocked a 10:28.56 for that victory. John Marshall’s Damara Ferguson claimed the title in the high jump with a clearance of 5-0. Union Local’s Allison Loase was victorious in the pole vault with a 10-foot vault. Harrison Central sophomore Thea Haney picked up a win in the discus with a twirl of 112-ft-3. Wheeling Central’s Nicole Billie was the champion in the 800. She raced two laps in 2:28.23. John Marshal sophomore Zara Zervos continued her strong early season with a win in the 400 meter dash in a time of 61.53. Earlier in the meet, she claimed the 1600 meter run with a 5:35.43.